Our Crystal Collection Candle Story. Our Crystal Collection Candle Story.. I've always been drawn to crystals. What's not to like right? They come in a variety of colors and shapes. They are smooth and feel great in your hand, they are just beautiful. But until recently I never knew much about them or understood what it is they really do or what they are. After taking the time to do some serious research I finally started understanding the benefits of their use. They have many energies and healing properties. I became intrigued, I wanted to know what I could do to help enhance them. Then it came to me. Candles! Warming crystals helps to release their properties without altering them. That's when the magic happened. My boyfriend (who happens to be in the candle industry) and I came up with the idea of incorporating crystals with candles. The problem was we didn't want the crystals buried at the bottom of our candles, where they wouldn't be seen or heated until you burned through to the end of the candle. We wanted them visible for the entire burn time. So after many trials and errors we figured it out! The end result is a beautifully crafted energy candle. We achieved everything we wanted. A crystal that was visible each time the candle is lit, allowing the wax to heat and release the stone's energy. 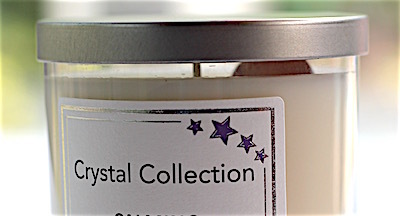 Crystal Collection Candles was born! Next came the branding of our Crystal Collection Candles. We thought of many options, but none that excited us. 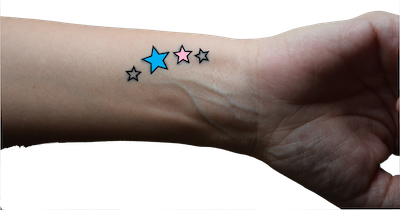 Then came a suggestion, I was asked about the tattoo that I have on my wrist. I explained it's special meaning, so our designer transformed it into our logo! We love the end result. 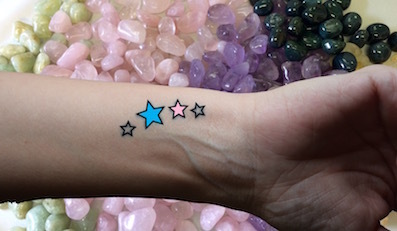 My wrist, our graphic artist took a photo and outlined my stars. My life long dream has finally come true!! My boyfriend told me I'm officially a "Rock Star"..HA! End result....our Crystal Collection logo. And Bracelets. What a fun journey this has been. What an awesome story! I love to hear how a company or product came into being. And I especially dig your logo!! Awesome! Love it all! 😊 And the logo looks beautiful! These look amazing! 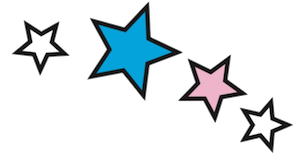 you are a ROCK STAR! Hard work and dedication you put a perfect brand/logo together. Best of Luck! Just placed my order and can't wait to receive them..